This title would be cool if it read like like My First iPhone Application or My First Android Application. I started with Turbo C for PC applications in 1992. Before 1996 I was using Borland C++, but finally surrendered to Visual C ++ 4.2 in 1997. In 1999 I upgraded to VC6 with Microsoft and stayed with the version for 10 years. After I changed to use my Sony VGN-FW235J in early 2009, finally I had to face the problem that VC6 is not supported in Windows Vista any more. I had to install this VC9(Visual C++ 2008) instead, but used mostly as a text editor for a year. 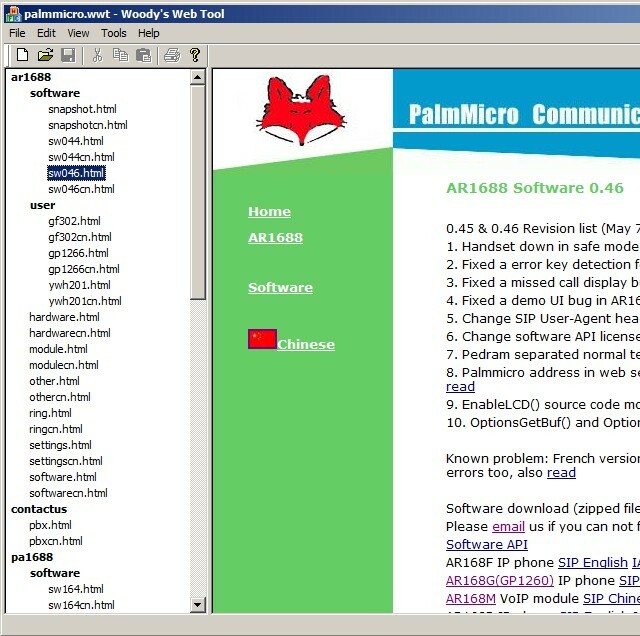 When I was moving Palmmicro web from palmmicro.com.cn to palmmicro.com earlier this year, I began to write this first application called Woody's Web Tool. It was designed to do those repeated copy, paste and FTP upload works automatically. As my web work finished recently, my application completed too. During my development, I was also considering if I should upgrade to Visual C++ 2010. However I met a developer from a professional software company last month and knew that they are still working with VC9, so I feel comfortable to stay with this version now. Although I installed help documents on my local hardware drive, I find it is always fast to get help information online. When reusing old VC6 source codes, I had to add _T() to all strings because of strictly unicode check. New CHtmlView class makes it so easy to view web files in application. New CFtpConnection class also makes it very easy to upload files to FTP servers. I still remember going to Hans Bethe and saying, "Hey, Hans! I noticed something interesting. Here the plate goes around so, and the reason it's two to one is . . ." and I showed him the accelerations. He says, "Feynman, that's pretty interesting, but what's the importance of it? Why are you doing it?" "Hah!" I say. "There's no importance whatsoever. I'm just doing it for the fun of it." His reaction didn't discourage me; I had made up my mind I was going to enjoy physics and do whatever I liked. Page 67 Surely You're Joking, Mr. Feynman! Wang Tian is perhaps the only person I know who programs software as entertainment like me. A few years ago when he was still with Microsoft, one day he suddenly told me that he had just written his first C# application, it felt good he said. As usual, I was slow on everything. 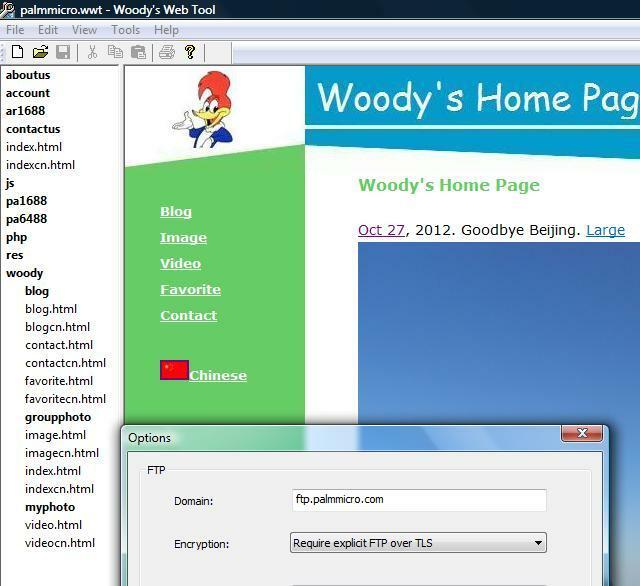 Even I had read about it online frequently and heard Wang Tian's feeling good experience, C# was not in my mind at all when I started to write Woody's Web Tool in 2010. I used my familiar MFC and CFtpConnection class to upload files to my web sites. Starting from last year, Yahoo Web Hosting began to inform me its moveing to only supporting FTPS, the dead line is today. Since then, I have been learning about FTPS and trying to find an easy solution for my application. The answer is quite simple, FtpWebRequest is ready as early as Microsoft .NET Framework 2.0. However, the native way to use FtpWebRequest is C#. I spent many time learning how to call it in my MFC application, including a lot of VC2008 compiler opition changes. Finally I got my FTPS working today just in time, with lots of exceptions unhandled. In the meantime, I deleted all Chinese resources from the tool, as I finally accepted the fact that I might be the only person who actually uses the tool, so it is unnecessary to maintain the extra Chinese resource work.